I always title these blogs as to what day it is. I force myself to do this because without it, I would have no idea whatsoever where we are on the calendar. Not important to myself, Karen or this trip, but we need such information when contacting the outside world in those infrequent sojourns back to reality. Speaking of which, the paper, Vancouver Sun arrived today at Gorge Harbor, a twice-weekly event. Normally I never look at newspapers, no matter the title, location nor scarcity in this case. However, the pictures of New Orleans under water that were emblazoned on the front page caused me to stop and add it to my purchase of orange juice. Having spent the first fourteen years of my life on the Gulf Coast, only one wooden bridge down the road from Louisiana, I remember tracking hurricanes as a boy with my map torn from our local paper. The blank tracking form was provided by the publisher for just such a purpose. I never experienced the likes of a storm of this magnitude when I was a boy. In fact, I would often go out in the hurricanes and pick up shingles as they were blown from their appointed places on roofs unknown. I distinctly remember the sting of the horizontal rain. It felt like small needles on your skin. The drops of water were harmless and somewhat exhilarating for a 10 year old boy. Unlike those in the path of Katrina, today was going to be a lazy one for the crew of the motor vessel Best of Times. I awoke at the usual time, 6:30, urged on by my internal alarm clock, better known as my bladder. Karen, however, was cocooned in the berth and was not to be disturbed. So I passed the time reading such things as Yachting and Blue Water Sailing. Appropriate enough given the circumstances. When “it” arose and gave a cackle, the signal had now been given to all that now the official start of the day was upon us. In a previous edition of this blog, we mentioned that it appears that not much to nothing had been done to address the list of problems with this boat one year ago. 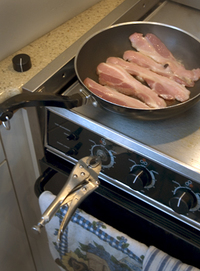 One of my favorites is the locking pliers I use for the left burner control on the cooking range. Vise Grips to the rescue. By the way, the bacon up here is great! As the picture illustrates, it is necessary to remove the quintessential black plastic knob and replace it with a pair of locking pliers if you want to maintain control of the temperature. It seems that as soon as the burner heats up, so does the metal stud the knob fits on to. The result is that the plastic knob expands just enough to prevent it from gripping the metal stud, thus rendering the assembly useless. The day was a lazy one and the weather had adopted the same attitude. It was dead calm in Gorge Harbor. With the dock clear of other boats and the weather and wind on hiatus, it was time for Karen to captain the boat as it left the dock. This would be her first time. A skilled navigator and comfortable at the helm while in route, she had not tackled the duties of the captain while arriving or departing from the dock. It is the most challenging part of the helmsman’s job, navigating tons of floating fiberglass next to an immovable structure. 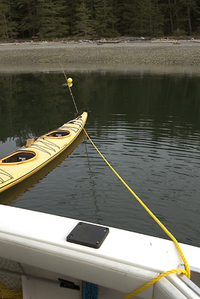 As I was certain would be the case, she commanded Best of Times off the dock at Gorge Harbor with aplomb. 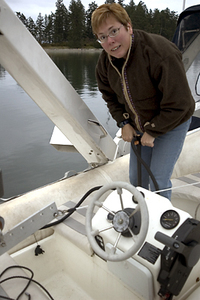 I on the other hand, taking Karen’s role as first mate, was on and off the boat securing the shore power cord, untying lines and tending to the proper stowage of the fenders. I’ll be resuming my Captain’s duties soon; it’s always warm, dry and comfortable in the helm chair. Karen took us out of Gorge Harbor, a wonderful place, a harbor enclosed on all sides, save for a small passage between sheer cliff walls. 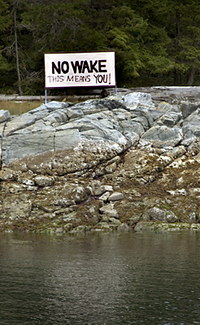 Narrow entrance to Gorge Harbor. Looked very small the first time. This year it seems much larger. Some things are universal, no matter your latitude or longitude. With lots of room inside, you can always find a comfortable refuge for the night. The harbor is also home to football field sized aquaculture farms. Nothing much more than floating cages with fish inside, the aqua farmers dance across the tops of the tethered structures tending to their “crops”. Captain Karen took us over to Rebecca Spit. This large but tranquil bay was to be home for the night. 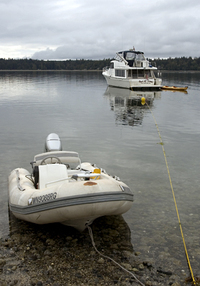 Drop anchor in 18 feet of water and into the dinghy to set the stern line. While the pictures you will see are of our stern lines set in place, these images are the result of quite a bit of finagling, and engineering. We must launch ourselves in the dinghy, dragging a 3/8" polypropylene line with us. The line held by Karen wants to turn the dinghy around while I try to make headway to beach the dinghy. Now beaching the dinghy requires that you get up a full head of steam and aim the rubber vessel square at the rocky beach. At just the right instant, so as to not lose all your momentum, you must stop the engine and raise it out of the water so as not to drag the prop on the rocky shore. Miss your timing, and the dinghy stops about two feet short. Now, the embarrassed captain must paddle back a little, lower the motor, restart and take another crack at his target. Somehow I think if Columbus was burdened with these modern inventions, he world have sailed on to Cuba rather than risk an unsuccessful landing. Karen "pumps up" the dinghy in preparation for our sojourn. The landing party prepares to attack the beach at Rebecca Spit. Speaking of miscalculation, our typical procedure for stern tying is to take one end of the line ashore, wrap it around something that will not move and return the bitter end to the yacht. That way, when you’re ready to depart, one simply lets one end go and pulls on the other end, returning the yellow line to its rather large wooden spool. The beauty of this is that there is no second round of beaching of the dinghy required. Plan B; tie the stern line to the tree, thus requiring only half as much line. That’s what we did, knowing that sometime tomorrow, we would have to launch the dinghy, throw ourselves onto the rocks and untie before we could ride the tide to our next port of call. Dinghy after a successful beaching and stern line mission. Stern tie in place at Rebecca Spilt as the kayak stands guard. Best of Times safe and secure, stern line and all in Rebecca Spit. On of the many B.C. Ferries as it passes Rebecca Spit on its regularly scheduled stop at Heriot Bay.